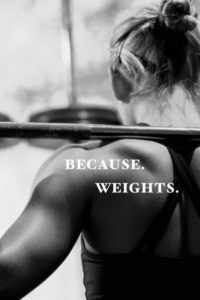 “Lifting weights is masculine, why would I want to do that?” The most common controversy regarding women and weight lifting is that women who strength train will get “bulky.” This idea is, in fact, a huge misconception. Scientifically, females do not have the proper hormonal balance, which includes testosterone and growth hormone, to be able to gain muscle mass like males. For women, increasing muscle mass actually has some added benefits, and women should consider these when contemplating including strength training into their exercise regime. It has been proven that adults who are inactive lose 3-8 percent of their muscle mass per decade. Strength training has the ability to preserve muscle mass thus counteracting muscle loss due to the aging process. It has also been proven that muscle mass can help you lose more weight! Adding muscle mass boosts your metabolic rate, which leads to more efficient burning of body fat throughout the day, thus leading to more weight loss. Basal metabolic rate, or BMR, is the amount of energy expended while resting. With more muscle, your body will burn more calories in this state of rest. One pound of fat burns approximately 2 calories a day, while one pound of muscle burns approximately 6 calories a day; that’s three times as many calories per pound of muscle! In addition to the physical benefits, strength training also effectively improves one’s mental wellness. Strength training increases self-confidence, allows one to set positive goals, and more importantly, it is great for stress relief. So, in order to compensate for the muscle mass that diminishes as we age, to help with weight gain, and to improve mental wellness, it would only make sense to incorporate some strength training into your regime. The recommended amount of time to spend weight training is at least three days a week. The most basic and fundamental exercises you should begin with are squats, dead lift, bench press, bent over rows, pull-ups, and military press. It’s important to start with light weight that way you can perfect the form, and then you’ll be able to adjust the weight from there. If you are a member at a gym, don’t be afraid to seek help from the professionals! Lastly, remember: COMMITMENT, DEDICATION, and CONSISTENCY will take you a long way.